Efforts to continue expanding voting rights to all communities and increase access to the polls generally address either the registration process or the method of casting a ballot. Reducing the barriers to registration through provisions for young people, online systems and same-day registration increases the total pool of potential voters. Allowing voters to cast their ballot at the time and location of their choosing in turn increases the total turnout in an election. Together, these programs are a vital part of growing the electorate and making elections as inclusive as possible. Early voting allows voters to cast a ballot in person for a period prior to the election day. This voting window generally lasts for somewhere between one week and one month leading up to an election. An early voting system does not require any excuse and it benefits those who have personal or work conflicts with voting on a Tuesday. Absentee voting is the process by which voters can mail in their ballots if they cannot or choose not to be present on election day. 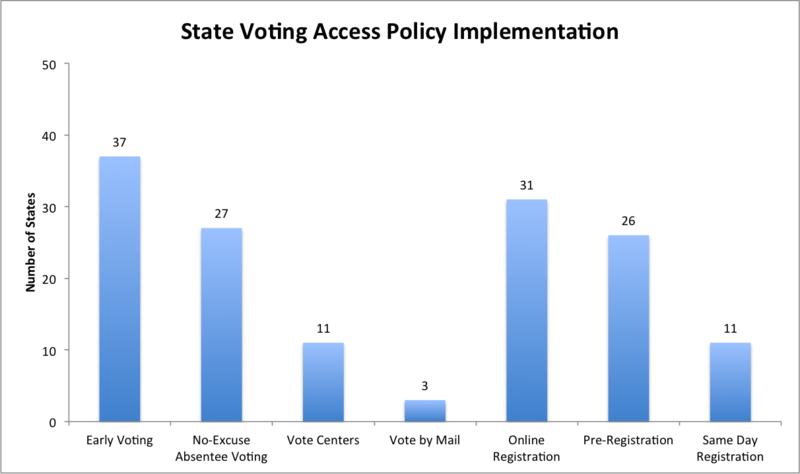 All states offer some version of absentee voting, but about half of the states do not require voters requesting an absentee ballot to provide any reason for why they cannot attend the polls. This program benefits people who prefer to vote in their own home or simply want to bypass polling place lines. Vote centers are a relatively new kind of voting method in which jurisdictions have many locations where voters can cast a ballot, regardless of what their home precinct is. This allows people to vote closer to where they work, shop or go to school rather than being limited to a single polling place. The goal of vote centers is to boost turnout by providing more convenient voting. Three states (Oregon, Washington and Colorado) hold all elections entirely by mail. Each registered voter receives a ballot in the mail which they can then fill out and return by mail or drop off in person. This system is extremely convenient for voters as they automatically receive a ballot, but there is some worry that voters could be coerced by family members to vote a certain way. Overall, vote by mail helps boost turnout by providing voters additional convenience. Online registration provides an additional and often more accessible option for voter registration than the traditional paper method. After a voter submits their registration form over the internet, an election administrator reviews the submission and verifies it against existing documents to confirm the applicant’s identity and information. This process helps save costs compared to paper registration, too. Same day registration, also known as Election Day Registration, allows voters to register at their polling place on the day of the election. Voters who wish to register on election day must provide proof of their residency and an identifying document to ensure they are eligible to vote and in the right jurisdiction. Many of the 11 states that currently have same day registration are among the national leaders in voter turnout. In Minnesota, for example, almost 20% of voters in the 2012 General Election registered on Election Day. Early Voting: No traditional early voting system, but voters can apply for and cast an absentee ballot in person for a period before the election. No-Excuse Absentee Voting: As of 2014, Minnesotans do not need to provide a reason they cannot reach a polling place when requesting an absentee ballot. While not identical, this program operates in a similar way to early voting. Vote Centers: No system of vote centers for dropping off ballots within a jurisdiction. Voters must either vote absentee (in person or by mail) or vote at their designated polling place on election day. Vote by Mail: No statewide vote by mail system, but mail voting for elections conducted by a rural municipality having fewer than 400 registered voters is allowed. Online Registration: System available since October 2013, authorized by state legislature in 2014. Pre-Registration: Any person who will be an eligible voter at the time of the next election may register, which primarily applies to 17 year olds. Same Day Registration: Minnesota became the second state to implement registration on election day in 1974. This program has largely contributed to the state’s exceptional voter turnout.